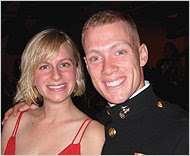 Operation Yellow Elephant: Harvard Grad Serves; How About You? Harvard Grad Serves; How About You? Isabel Robinson Stockman, a daughter of Lisa Russell Stockman and Robert Bernard Stockman of Princeton, N.J., was married at her family’s farm there on Saturday afternoon to Lt. Peter Harrington Brooks, a son of Virginia Woodworth Brooks and Stephen Harrington Brooks of Weston, Mass. The Rev. Valerie Webster, an Episcopal priest, performed the ceremony. We thank the happy couple for their service to our country and wish them all the best. We also encourage all eligible Americans, regardless of their politics, to consider volunteering for military service. If the American people agree with you in November, won't [y]our President need your help?